To share a diagram with teammate means to let him or her view the shared diagram, either through a web browser or through mobile device, and to allow him or her to give comments on the diagram, or shapes in the diagram. Sharing works in diagram based, meaning that when you share a diagram with someone, he/she can only view that diagram, but not the other diagrams, unless the other diagrams have also been shared. In Visual Paradigm, open the diagram you want to share. Make sure the diagram have been committed to the server. You can only share a diagram that has been committed to server before. Open the action bar by clicking on the tiny button on the right hand side of the diagram, near the scrollbar, if exist. Open the PostMania Topic Pane button by clicking on its button in the action bar. At the top of the PostMania Topic Pane, click Share and then select Invite Viewers... from the drop down menu. Enter the name and/or the Email address of the people to share with. If a person to invite is an existing viewer/member, you just need to enter his name and pick him up from the drop down menu. If he is not currently a viewer, please enter his email address. PostMania will send invitation Emails all people specified, to invite them to join PostMania for viewing and commenting on the diagram to be shared. 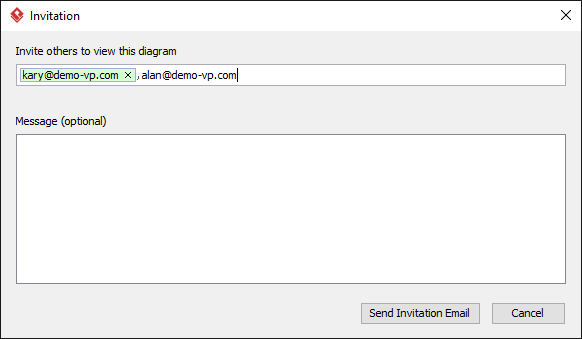 You can optionally include a message, which will be included in the email PostMania send out. Click Send Invitation Email. PostMania will send the invitees invitation Emails in three minutes. NOTE: If the invitee is an existing viewer, and has opened the notification page/view of PostMania, either in a web browser or in Android apps, he/she will not receive the email notification. Click on Accept Invitation in the Email to open the New Viewer Form in web browser. Enter the password and click Accept Invitation in the form. Then, he/she will be redirected to the diagram shared. To share a diagram with someone, you can enter his name and email address and send him an invitation, which was described above. Besides, you can give him a URL to open the sharing diagram in web browser. If he is already a viewer/member, he will be prompted to login to his VPository account when he visit the given link. Once logged in, he can view the diagram you shared. If he is not a viewer, he will be asked to join PostMania as a viewer to view the shared diagram. At the top of the PostMania Topic Pane, click Share and then select Share by Link from the drop down menu. In the popup window, click Generate Link. Copy the link by clicking Copy to Clipboard. Now, you can ask others to visit the link to view the diagram. At the top of the PostMania Topic Pane, click Share and then select Share Layers... from the drop down menu. Follow diagram: Follow the visibility setting of layers. Layers that are currently visible are shared, whilst hidden layers will not be shared. In other words, what you can see will be what the viewer can see in PostMania. Specific layer only: Select the layers to share. Non selected layers and any newly created layers will be invisible when the diagram is being viewed in PostMania. Exclude specific layers: Select the layers to not share. Non selected layers and any newly created layers will all be visible when the diagram is being viewed in PostMania. Click OK. The change will now be reflected in PostMania. In the popup window, click Disable. Note that by disabling the URL, new attempts to browse the diagram with that URL will be denined. Yet, viewers who have browserd the diagram before will remain accessible to the diagram.